Various County Council's are responsible for a wide range of services including the safety of pedestrians on footbridges, walkways and paths across their land. After one particular bridge became a slipping hazard, the council turned to GripClad a Trusted Safety Solution. 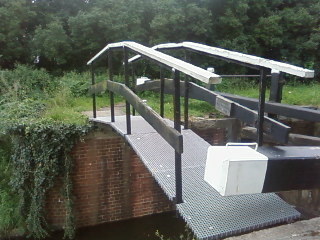 Provided anti-slip solutions across footbridges throughout Canal network. Amongst the many county council's we supply solutions to, this county council is responsible for the health and safety of anyone using its land and facilities. The wooden slats on the council's canal footbridges were becoming weak and unstable. A total structural replacement was needed together with an enhanced long term slip resistant surface, especially near canals and lock mechanisms. The metal framework which was sound, everything was included in this project from the complete replacement of timber slats for GRP Minimesh Grating and all fixings to 26 Footbridges. Our GRP mini mesh gratings was the first choice as it will offer extended service life and real value, plus a slip-resistant surface. Guaranteed drainage and slip resistant walking surface using GRP Grating. This new grating product adds zero maintenance where these areas will never need to be replaced. "Once we realised that a weather resistance material like GRP Grating was available we re-examined the options and we had no hesitation but to take this route with Gripclad.